Swipe Telecom, the low-cost tablet maker has recently launched an online only sub-brand Elite along with a new ‘Freedom OS’ based on Android 5.1 Lollipop. 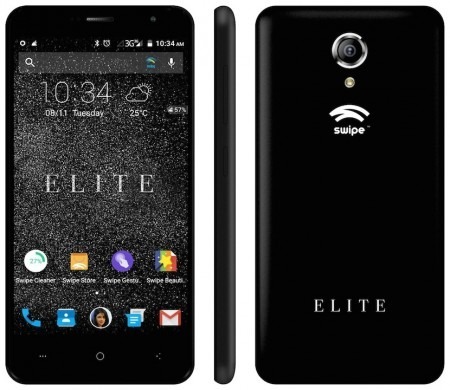 The first smartphone ‘Swipe Elite‘ that was launched exclusively through Flipkart for Rs.6,499 runs on this same OS. The device came with powerful specifications when compared with the other devices at the same price range. Today the company has unveiled a new updated ‘Freedom OS 1.1’ with enhanced user experience. It almost packs the same UI as the stock Android, but with additional features. The new Swipe Elite smartphone comes with same specifications and runs on updated Freedom OS 1.1. There is a new dialer pad with a lot of customizations based on the themes, colors, and fonts. You can even customize the theme with different colors and it also allows you to re-arrange dial pad tabs. The call logs of the OS can be resizeable and can also customize the fonts as you choose. It also has a new feature that will refine the low-quality image of the contacts to look sharper and better quality. You can also even choose the circular, square or round shaped frame for the contact images. The quick actions in this new OS can also be very useful, if you slide left on a contact it makes a call, and while slid to the right it will take you to the message box. The one-handed mode gives complete control of the device just by using the thumb. You can align it either on the left or the right of the screen. This new OS comes with animated wallpapers on the lock screen of the device. To make switching the Wi-Fi or Data to be turned on or off, you can directly access on the quick access app drawer without unlocking the screen. Mr. Gandhi, Founder & CEO said, “With updated Freedom OS, we usher in an OS revolution in the Indian market. We are overwhelmed with the enthusiastic response and feedback we received for our Freedom OS. We are extremely grateful for the encouragement and support from the users and are returning the love by breaking our very own unprecedented benchmark with an upgraded version”. This OS will be pre-installed on the upgraded Swipe Elite smartphone that will be exclusively available starting from September 25th on Flipkart. The device comes available only in the color Black. If you are looking for a device with better specifications, this is one that offers at a low price tag.